Nanoparticles provide a promising way to deliver cancer drugs in a targeted manner, which help to kill the cancer cells without affecting the healthy tissue. The downside is that a most of the nanoparticles previously developed are only capable of carrying one or two drugs. A team of MIT chemists have recently demonstrated that they can enclose three or more drugs into a novel type of nanoparticle, allowing them to develop a tailored combination cancer therapies. By experimenting on lab mice, the team demonstrated that the nanoparticles could effectively deliver three chemotherapy drugs and reduce the size of tumors. The research findings have been featured in the September 14 issue of the Journal of the American Chemical Society. In the same study the chemists also revealed that when drugs are delivered using nanoparticles, they do not work by the same DNA-damaging process as when delivered in their traditional form. Jeremiah Johnson, the Firmenich Career Development Associate Professor of Chemistry and the senior author of the paper stated that this particular finding is important as several researchers typically presume that nanoparticle drugs are functioning in the same way as the original drugs. Although the nanoparticle drug version may destroy the tumor, it is crucial to understand the behind-the-scene mechanism of action when selecting combination therapies and seeking standard approvals for new drugs, he adds. People tend to take it as a given that when you put a drug into a nanoparticle it’s the same drug, just in a nanoparticle. Here, in collaboration with Mike Hemann, we conducted detailed characterization using an RNA interference assay that Mike developed to make sure the drug is still hitting the same target in the cell and doing everything that it would if it weren’t in a nanoparticle. Johnson’s lab first reported the new nanoparticle production method in 2014. This method differs from other techniques that chemically attach or encapsulate drugs to a particle. The MIT team instead developed particles from building blocks that inherently possessed drug molecules. They can connect the building blocks together in a definite structure and precisely manipulate the quantity of drugs that are incorporated. A major advantage is that this method can be used to deliver drugs that usually cannot be encapsulated using conventional techniques. The researchers delivered doses of three chemotherapy drugs using the new particles. The drugs - cisplatin, doxorubicin, and camptothecin – at concentrations would have been lethal if administered by injection throughout the body, as is generally done. Mice with ovarian tumors underwent this treatment, and the tumors shrank and the mice survived much longer with few side effects than mice that were untreated. Performing combination chemotherapy using these new designer polymer nanoparticles is an exciting new approach to chemotherapeutics, and this polymer platform is particularly promising for its ability to carry a large load of drugs and deliver them in a triggered, controlled manner. Using a technique developed by Hemann’s lab, the MIT team then tested how their nanoparticle drugs influence cells. 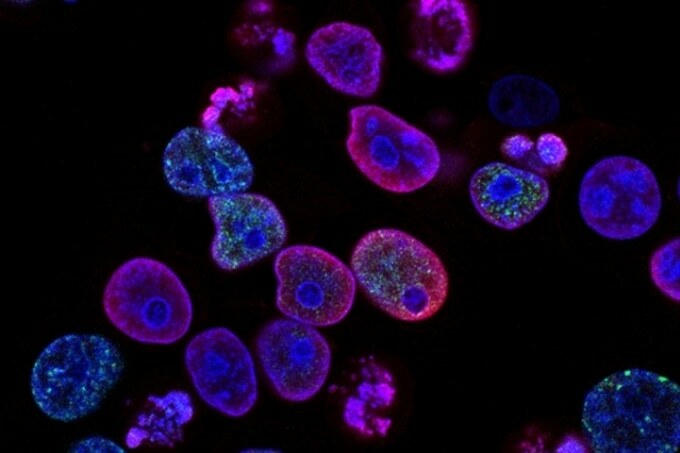 The method measures the effects of cancer drugs on eight genes that influence the programmed cell death set off by cancer drugs. This allows researchers to categorize the drugs according to which clusters of genes they influence. Drugs that damage DNA get clustered into DNA damage-inducing agents, and drugs that inhibit topoisomerases cluster together in another region. If you have a drug that you don’t know the mechanism of, you can do this test and see if the drug clusters with other drugs whose actions are known. That lets you make a hypothesis about what the unknown drug is doing. The MIT researchers discovered that nanoparticle-delivered camptothecin and doxorubicin functioned as expected, but cisplatin didn't meet expectations. Cisplatin usually functions by connecting adjacent strands of DNA, which causes damage that is virtually not possible for the cell to repair. When delivered in nanoparticle form, the team found that cisplatin functions quite similarly to different platinum-based drug known as oxaliplatin. This drug also kills cells, but uses a different mechanism. It binds to DNA but stimulates a diverse pattern of DNA damage. The team suggests that once cisplatin is discharged from the nanoparticle, via a reaction that triggers off a group called as a carboxylate, the carboxylate group then reattaches in a manner that induces the drug to behave a lot like oxaliplatin. Several other researchers attach cisplatin to nanoparticles in the same way, so Johnson deduces that this could be a more extensive issue. Presently, his lab is exploring a new version of the cisplatin nanoparticle that functions according to the same mechanism as standard cisplatin. The team are also creating nanoparticles with varied combinations of drugs to investigate against pancreatic and other types of cancers.